Best Orange Amps Reviews: 5 Top-Rated in April 2019! 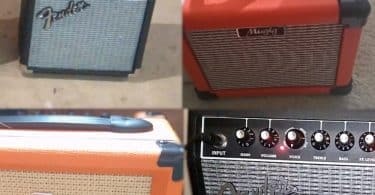 If you are out looking for an amp, consider the following details before buying the first one the amp pimp pushes on you. Amps are not stand alone devices; they work in collaboration with a pre-amp, a speaker and an instrument. As such, when you go to buy an amp, you need to make sure the instrument you use it with you to test the amp. The sounds you produce at home, with your guitar, will not be the same sounds you test using a shop guitar with an amp in the shop. So bring the experience of testing as close to home as possible, take your guitar and test it directly. There are three types of the amp out there, tube, solid state, and hybrid. A tube amp is more expensive since tubes are now a lost science, that is mainly used by people that cling to misconceptions about electronics and how wavelengths are formed and controlled. Thinking that a tube can make deeper tones when compared to a modern solid state device is like comparing a WWI biplane to an F35. Sure, it’s nice, it’s classy and its retro, but it isn’t better and never will be. You have to remember that sound is wavelength, and this can be created by any solid state device with enough micro-circuitry connect to the right speaker to create perfect tones and harmonics. The power of an amp is important, and a good 10w amp is perfect for home use, a 15w amp is great for rehearsal and small gigs, a 30w amp is what you want for outdoor gigs and powerful recording. Anything above that is moving toward concert hall size of the output. Take into account that the amp doesn’t produce sound, it merely produces an electrical current that carries the sound wave order to the speaker which converts the current into sound. Therefore the speaker is as important as the amp, and the amp must be equal to or more powerful than the speaker. However, don’t buy an amp that is more than double the power of the speaker, or you might end up damaging the speakers. When investing in an amp, consider all the features you need, and only invest in an amp that provides you with the versatility that you require. In other words, if you don’t use it, don’t buy it. Test the amp by twiddling the knobs and checking its performance with your guitar. It’s also wise to consider buying an amp that has multi-channels and has a separate EQ for each channel. Since this article is all about Orange, let’s take a look at this company and see what they have. 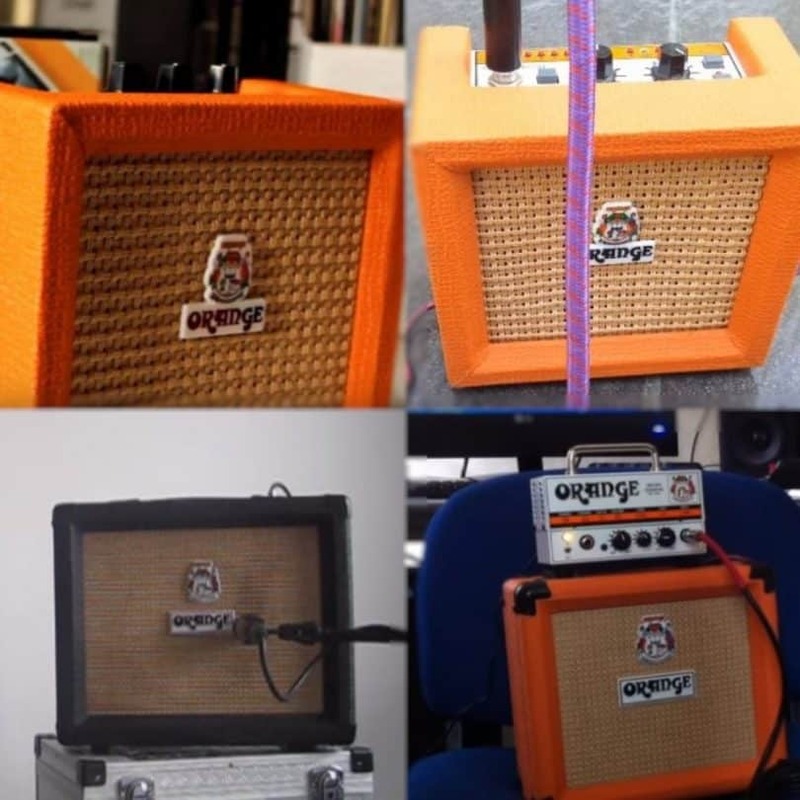 Orange Amplifiers are considered to be one of the leading brand names in amps on the market, and they produce a nice range of amps to choose from. Each amp is perfectly designed for a specific performance and application role. The name also suggests the color that these amps come in, and yes, all but a few are Orange. This company was founded in the 1960s, when music was slowly changing from the slow beat to extremely fast beat with electronic music only emerging in the 1970s. Orange is a British company and grew up alongside the legends of the 60’s such The Animals, The Beatles, the Bee Gees, Donovan, Marianne Faithfull, Gerry and the Pacemakers, Herman’s Hermits, Tom Jones, The Kinks, Manfred Mann, The Rolling Stones, The Tremeloes, and The Who. With such a pedigree of users, all of whom at one time touched an Orange amp, its no wonder that Orange is considered to be one of the favored amp producers of all time and their products are beyond reproach. Now let’s take a look at five of the best amps of all time, the Orange amp line up. 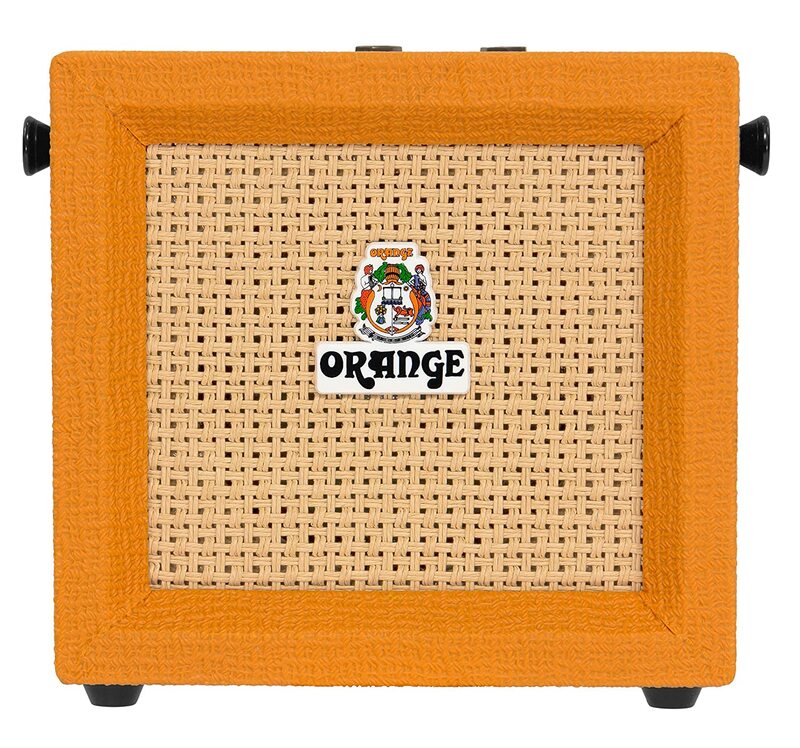 The Orange Crush Mini is a 3-watt amp that was recently redesigned for a more classic tone output. This model is a small and lightweight amp that is best used for warming up backstage, using for practice or just jamming in the bedroom. The Crush Mini comes with a new control panel that gives you full gain, shape, and volume with full tonal control. When you reduce the gain, and up the volume, you get that classic Orange crunch, and if you up the gain you end up burning holes in your socks. This model comes with Micro Dark shape controls, which includes cuts or boosts the mids, giving fat mids through to scooped tones. This model also comes with 8 Ohm speaker output, so when you use preamp stage, you get to plug into an external speaker cabinet which opens up even more capabilities. This is enhanced with the integrated tuner and headphone output that makes for a silent output and the AUX IN feature lets you play along with any music score you have. Three controls volume, shape, and gain. A perfect small amp solution for your daily practice and small jamming sessions. When it comes to power and performance, the twin channel Crush 20 provides you with a comprehensive, powerful 20-watt foot switchable performance. This model comes with Clean and Dirty channels with a new high gain, and a four-stage preamp design that delivers up a huge range of overdriven and distorted sounds that are rich in harmonic overtones. If it’s a power punch of sound and clarity to create an atmosphere of unbridled harmonics, the Crush 20’s custom 8″ Voice of the World speaker is basically a force of nature. This amazing innocent looking orange box of the fun comes with all the Orange features you know and love. What you get is a twin channel amp combo with a high gain preamp, a 3 band EQ, AUX IN and CabSim loaded headphone jacks. The CabSim headphone and line emulates the sound of the cabinet loaded with the Orange flagship Voice of the World speakers, providing you with a perfect silent practice or recording session. Full controls including instrument input, clean volume, dirty gain, bass, middle, treble, dirty volume. 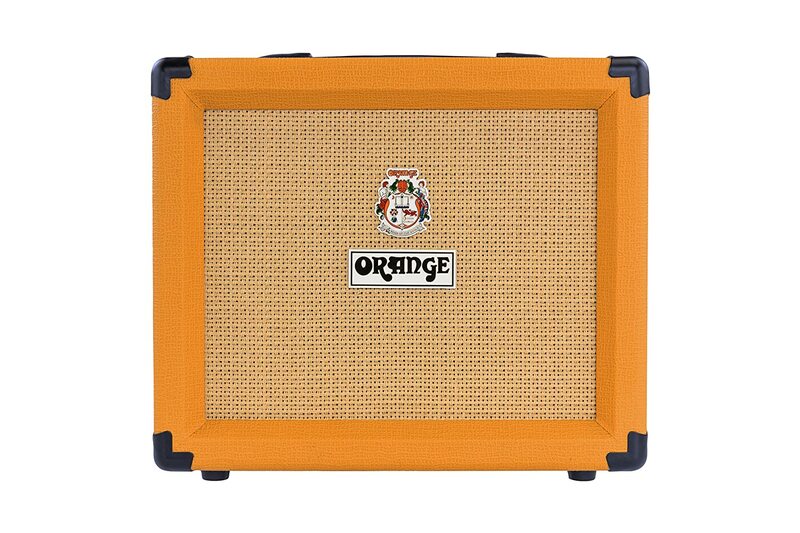 This is an innocent looking orange amp speaker combo that defies the speed of sound and should have been used against Thanos. 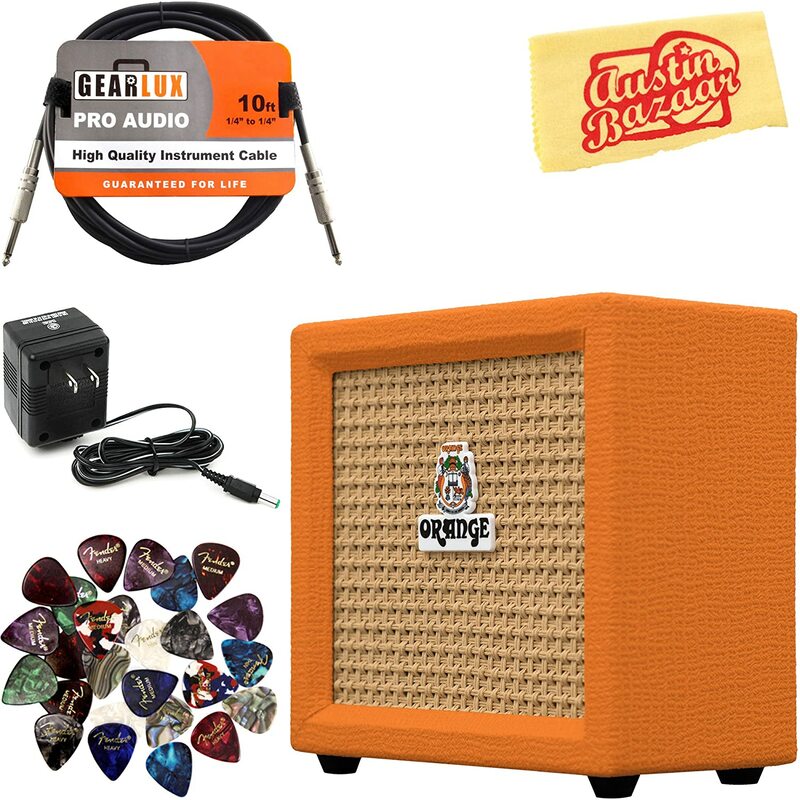 This is the Orange PPC108 1×8″ Closed-Back Speaker Cabinet with Orange MT20 Micro Terror Amp Head combo. Take an Orange Micro Terror or Micro Dark and combine it with an 8” Voice of the World speaker and what do you get? OMG, you get unadulterated sound, tone, and harmonics all delivered with a 20-watt punch of pure power. These are the perfect speakers for combining with an Orange amp but built specifically to perform perfectly with either the Micro terror and the Micro Dark amps. Remember, its all about pairing the amp to the speaker to get the best performance and to maintain both devices and protect them from damage. This is what Orange has done here; they created a perfect combo kit so you can enjoy all your practices and performances with one brand set. This is the speaker of choice for your orange amps, don’t even bother looking for anything else its just not worth it. Its small, its Orange and its 3 watts. What can it be? 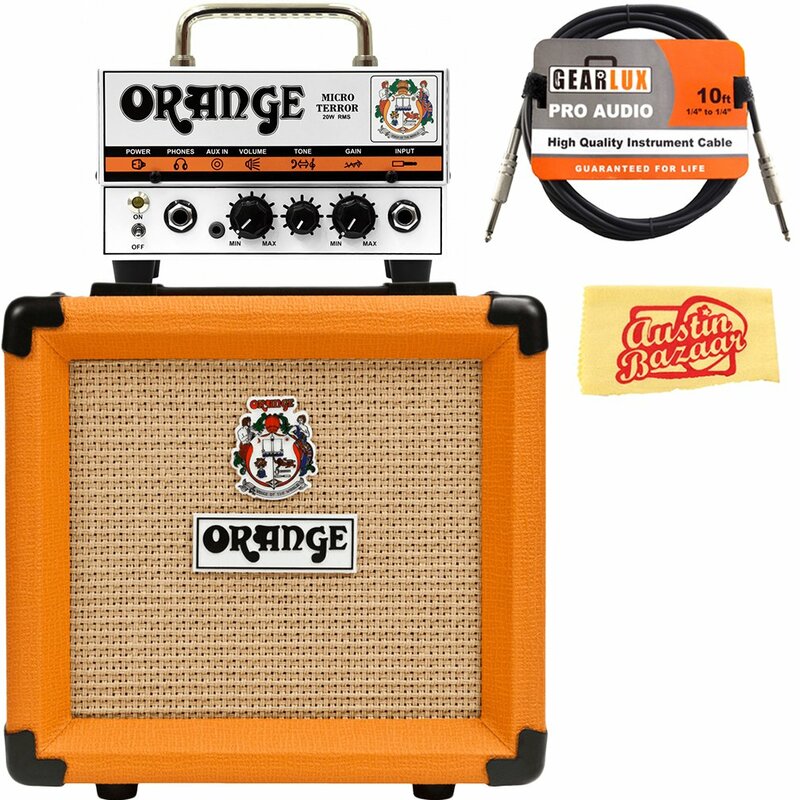 Obviously, it’s an Orange micro amp that comes with a speaker and tuner and delivers perfect tones for your home and practice needs. The speaker grille comes with the classic Orange basket weave, and the cover is Orange, so there is no mistaking this model. The system is designed to provide digital performance with analog amplifier circuitry, and it comes with an integrated chromatic tuner. This is a low impedance model that is powered by a 9v battery, so it were easy to carry around and used wherever and whenever you want. 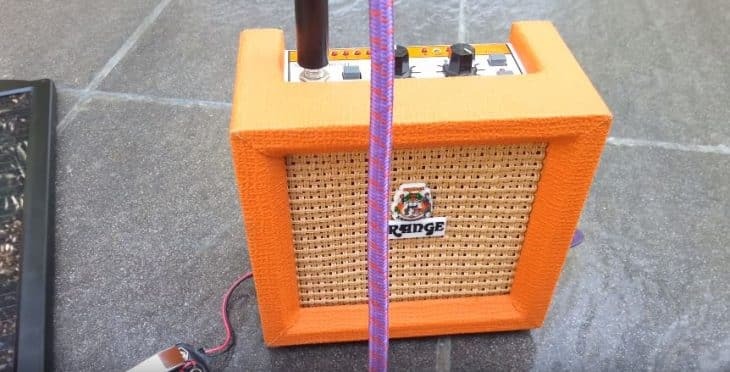 Since this is an Orange, there is no impact on the quality of the output of the device, and you get perfect harmonics and tones from a small yet Orange powerful 3-watt amp. Its small, it is powerful and don’t call it a dwarf, ‘cos its bark is going to chop you up. 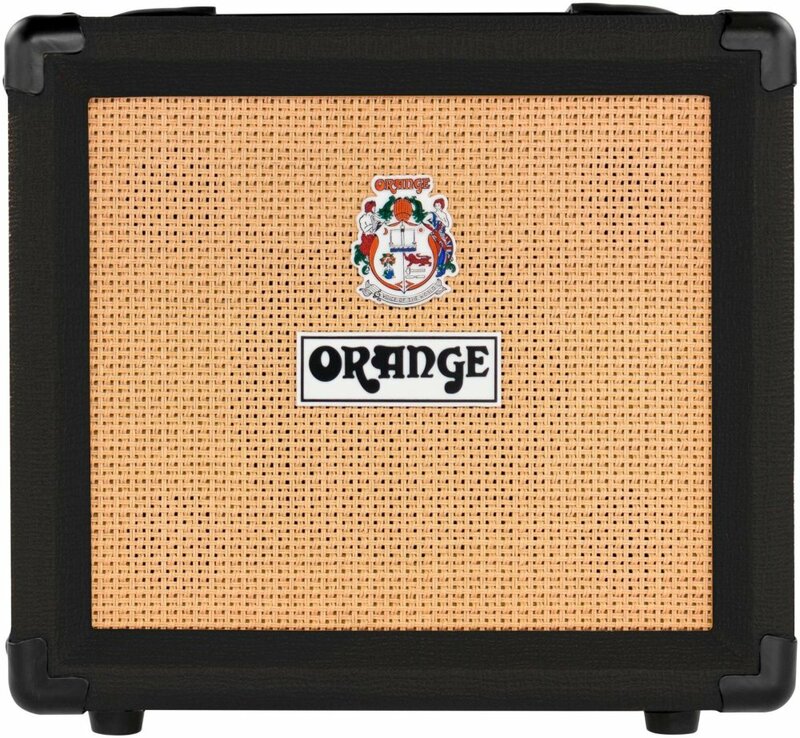 So you think that being Orange means you’re an Orange, well think again, this model is a black vinyl covered amp and yet it’s as Orange as all the other Orange products. The Crush 12 is the smallest of the full-format Crush models. This design was created for a no-nonsense performance for quality analog tone. This is a single channel combo amp that comes with a 3 band EQ and dedicated Overdrive control. 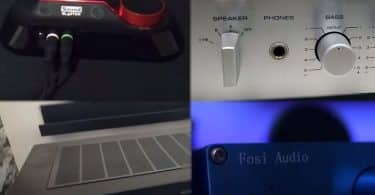 The speakers are the Orange 6″ Voice of the World speakers that are set for perfect sync with the amp electronics, and there is a CabSim headphone jack for silent practice mode. This model also falls in line with the Orange analog output, and while it uses solid state circuitry, they have created a perfect analog mimic, so you feel as if you are listening to a live guitar and not an amped sound. The overdrive five you that wide range of dirty tones, which ranges between sweet and crunchy to rich and thick. You also get to control the sound with the EQ controls. This model, while coming in Black Vinyl is a classic Orange with the Orange basket weave speaker cover and control panels. Full controls including Instrument input, gain, overdrive, bass, middle, treble, and volume. 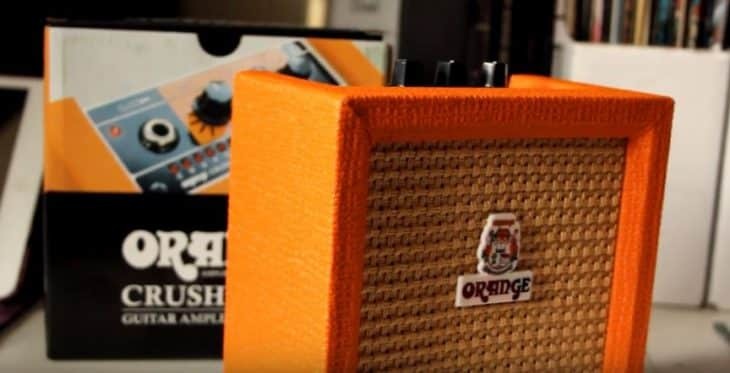 It’s nice to close up an article with a perfect 10, and this device, the Orange Crush 12 is a perfect 10, (or 12) since it combines the smooth low sounds of a practice amp with the power and rage of a full-scale performance amp.